A sharp line of stormy rain is advancing rapidly across southeast England, heralding the arrival of winter chill. If I time it right, I think, I can get to the chemists in Stroudley Walk before it arrives. I time it wrong. "Stroudley Walk Market lies in the heart of Bow, an area which was immortalised by Chaucer in his Canterbury Tales. Situated within the East End, people often believe that to be a true Cockney you need to be born within earshot of the sound of the Bow Bells." I laugh sometimes at the twaddle written about my local shops. Chaucer wrote about a nunnery later destroyed by Henry VIII, not the scabby ruins of a churchyard half buried beneath a dual carriageway. The Bow Bells beloved of Cockneys are in Cheapside, three miles hence, a fact which regularly escapes the marketing muppets hired to upsell Tower Hamlets. I see the squall advancing up Rainhill Way, a swirling curtain of water whipped up by the wind. In a split second it's upon me, damper by multiple factors than the previous rain, a whole new meaning to the word wet. Fortunately I'm only a couple of steps from the shelter of the arches outside the old post office so duck under, shiver imperceptibly and stop to watch the onslaught. 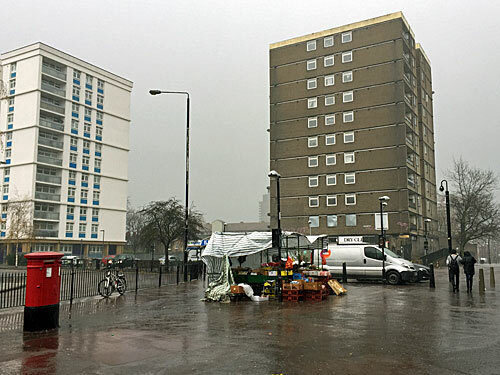 "Serving the local community as a small local market providing fresh fruit and vegetables, Stroudley Walk Market supplements the other local provisions in the square, such as the post office, dry cleaner and health centre." Whoever wrote this blurb has mastered the art of overstatement. What they've called "Stroudley Walk Market" is in fact the ultimate in a micro-economics, a single market stall plonked in the middle of a gaping concrete void. Postwar planners had high hopes for the viability of this rebuilt high street, leaving space for at least fifty market stalls along a pedestrianised piazza. Instead just one trader sets up his fruit and veg stall daily, a few boxes of fruit and veg unpriced beneath an awning, and local mothers look in occasionally for okra and onions. A barrage of water flushes down onto the single stall, its striped sheeting flapping in the gale. The group hiding inside is hit sideways by an icy blast and swiftly recognises that staying put is not an option. The trader runs first, dashing across the square to the closest end of the brick arcade. His partner follows a few steps behind, and then the two ladies who were either shopping or talking, it's no longer possible to tell. Both are briefly but emphatically soaked, their headscarves no match for the December monsoon. Next to flee is an empty wooden box, tipped off its crate and toppling onto the pavement at an awkward angle. A young Chinese couple, glasses steamed, run in from the High Street. They were much further from shelter when the rain strengthened, all of fifteen seconds ago, so have had to make a fast dash to our colonnade to avoid getting sodden. We wait together, the seven of us a microcosm of the new East End, outside a shuttered window and a locked door. The Post Office in Stroudley Walk closed in 2014, and reopened at the back of a supermarket on Bow Road. Nobody mourned. Its miserable interior has been shut off ever since, no other commercial interest interested, nor ever likely to be so. The fish and chip shop nextdoor metamorphosed this summer into a halal grill specialising in chicken in a variety of moulded forms. Its menu does include something called 'Cod Meal', but more likely microwaved than fried, and you're no doubt better off with a biryani. 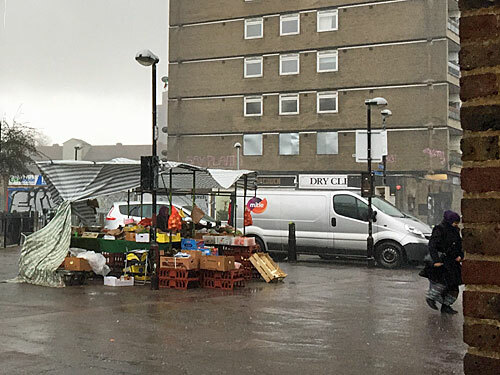 The rain eases fractionally then whips back with a stormy squall which makes the market stall almost disappear. We hunker down as the precipitation comes in sheets. The pool of water accumulating on top of the awning inexorably approaches critical mass, then suddenly gushes over the lip in a heavy wave. A box of fruit or vegetables underneath proves perfectly positioned for a consummate soaking. I think tomatoes, but maybe onions, and now is not the time to go over and check. A young man in crocheted cap and tunic splashes by, running from midday prayers to the DLR, because needs must. On the far side of a growing puddle, the electronic screen on what used to be a phone box beams out a video advert for Hugo Boss fragrance, in flagrant disregard for the local demographic. Ladbrokes must surely be missing its most persistent betting clientele this lunchtime, because nobody'll be keen to slouch outside with copious cans of lager in this weather. The dry cleaners finally closed a few weeks ago, or rather was relocated to an alternative unit near the hairdressers, entirely lacking the grimy ambience of the original. Its flight leaves the entire parade shuttered and empty, ready for redevelopment plans that have been on the drawing board for years but never yet materialised. All the units at the far end of Stroudley Walk are due to be demolished and replaced by flats. The entire windswept expanse where a bustling market never materialised is due to become more flats. The tallest block of flats is due to become a taller block of flats. The former Rose and Crown is listed so can't be knocked down, so will likely remain a peri-peri coffee shop. The Chinese couple are the first to make a break for it, ill-advisedly as it turns out, the rain conspiring to strengthen as they flee. I hang on another minute, because I've seen the radar image so know the storm front is only brief, and my hair might just dry out a bit while I wait. When I'm satisfied the worst is past I duck out from my shelter and continue past the corner shop to Bow Pharmacy, where it turns out they don't have my tablets in stock anyway so I need never have come. The rain is less ferocious on my return. The fruit and veg stall is being reassembled, ready for occasional ladies to drop by and gather ingredients for tonight's dinner. The remainder of the piazza is quiet, as it generally is these days, in sharp contrast to 100 years ago when this was a positively thriving high street. If post-Olympic plans get their way a fresh retail district will be constructed on the other side of the A12 where Tesco is now, and what commercial life there is in this economic backwater will be mostly flushed away. Stroudley Walk feels utterly washed out, and not just because of the weather.